An Xbox Live Arcade classic becomes something more on the Nintendo DS. It's time to explore you some Galaxies! When you try to stretch out a simple formula into something more, you run the risk of alienating the fans of the franchise, as well as any newcomers who may be fooled into thinking that it's a good product in itself. Bubsy 3-D comes to mind. Hey, Bubs did just fine as a 2-D platformer, but then someone decided to make a really lame 3-D one. Thanks, development a-holes. 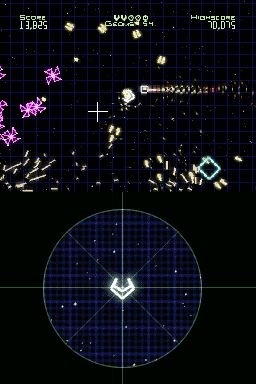 Anyway, Geometry Wars: Galaxies takes a much different, more successful route. Sierra and Kuju Entertainment take the simple yet satisfying Xbox Live Arcade shoot-em-up and expands it in just the right way. As a result, these Galaxies deserve scavenging. The controls are mostly about the same -- you fly through levels and shoot the living crap out of enemies and occasionally drop a super-bomb to clear the screen. However, the concept's gone the extra mile with a variety of new level designs. Some feature Pac-Man-like maps with enemies filling the corridors; other are wide open fields with twisting paths and other traps to keep you on your toes. The enemies have changed a little bit, too. 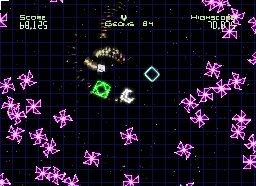 There's still plenty of "glow worms" and multi-shaped enemies, but new ones such as kamikaze glowers and paper-airplane-like darters are great to see. The real big additions, however, are the Geoms and the drones. The Geoms are collectible credits that are usable for unlocking new levels throughout the galaxy. It's pretty easy to collect them and spend them, but the real trick is building the multiplier. With each Geom you pick up, the multiplier increases, up to 150 times. As a result, your score can climb into the billions -- a huge plus for the online-accessible leaderboards. As for the drones, they're helpful little bots that serve individual purposes, and they can be upgraded. The sniper bot is ideal for firing off precise, quick shots, while the turret bot stops on occasion and shoots everything around it. Others play defensively and even collect Geoms for you, so they're all worth trying out. The gameplay consists of either routine button-mashing play (ala home versions of Smash TV) or with the touch-screen. Your movement is controlled with the D-pad while the touch-screen acts as a guidance tool for your shots. (An option is present for lefties as well.) It works fine for the most part, although directing your fire via a stylus may take some getting used to. Galaxies also runs into some slowdown on occasion, slowing the tempo of the game tremendously. Fortunately, it's intermittent, and doesn't really happen that often. The presentation looks good otherwise, and the techno music is a nice touch. Along with several levels scattered throughout Galaxies, you'll also find a few extra treats here. Multiplayer is hugely supported. Not only can you hook up with a fellow player in co-op or versus action with another cart, but you have Game Sharing options to share the Geometry Wars love. You can also log onto the Wi-Fi Connection and share your high scores with others. A version of the game that started it all, Retro Evolved from Xbox Live, is present and accounted for. Best of all, if you have both the Wii and DS versions of Galaxies, you can hook them up together and unlock a whole new galaxy with very little trouble. Yes, we love that. What's Hot: Terrific expansion of the Geometry Wars franchise; multiplayer options; the addition of Geoms and unlockable galaxies are awesome. What's Not: Touch-screen control can be quirky; occasional slowdown stalls the game's upbeat tempo.